Weekend Electronics Sale! Save on electronics & accessories. 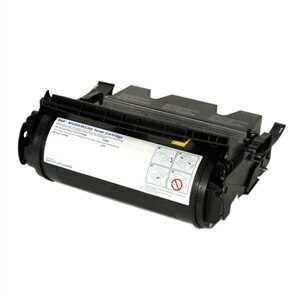 Genuine OEM Toners from Dell are designed for your Dell printer, and deliver up to 20000 pages with excellent print quality, clear images and crisp text. 48-Month Installment Loan (“Loan”) offered by Dell Financial Services Canada Limited on approved credit to eligible customers. Annual Percentage Rate (APR) range is 13.99% to 28.99%. Your monthly payment will be based on the APR assigned to your Loan, which we will determine based on our assessment of your creditworthiness. Monthly payment amount set out in the ad is based on an APR of 13.99% and an advance equal to the advertised price for a specific product configuration. Minimum transaction amount of $199 is required. No down payment required. Example of a Loan with an APR of 13.99%: $999 advanced; $27.29 monthly payment; total payable is $1309.92; total cost of borrowing is $310.92. Example of a Loan with an APR of 28.99%: $999 advanced; $35.39 monthly payment; total payable is $1698.72; total cost of borrowing is $699.72. To apply for financing, choose Dell Financial Services as your payment method at Checkout, contact Dell at 1-866-640-3355 or chat real-time with a Dell expert online at Dell.ca/chat. Offers a yield of up to 20000 pages. Actual yield varies with use and environmental conditions. All prices exclude taxes. Prices subject to error. In some provinces, Dell may be required by regulation to charge customers for an Environmental Handling Fee. Where applicable, these fees will be included in the final invoice per provincial requirements. Promotional pricing is not combinable with any other offers or volume based or other discounts to which you may be entitled unless otherwise specifically advertised. Availability may be limited. Pre-loaded software does not include documentation and may differ from retail version. Dell Loyalty Program: Program is intended for individual consumer (i.e. home) customers and is not applicable to businesses or resellers. Customers get 3% on a Dell Promotional Card for Eligible purchases over $100 or more (excluding taxes and fees). Certain products including electronics and accessories may not be eligible. A code to access the card arrives separately via email, typically 30-35 days from ship date. Card expires in 90 days (except where prohibited by law). Terms and conditions apply. Dell Promotional Card issued by Peoples Trust Company pursuant to license by MasterCard International..